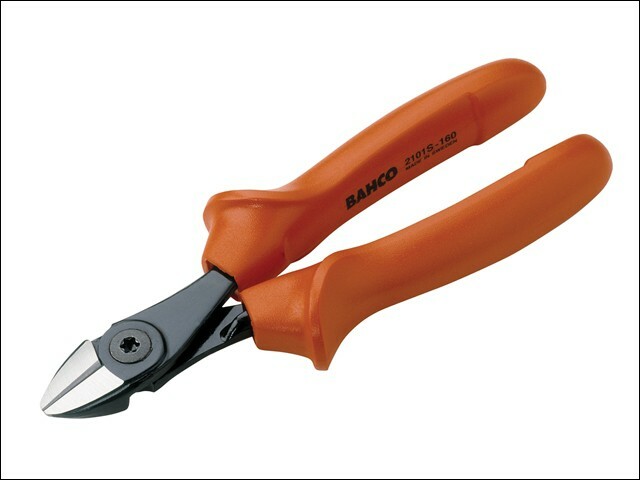 Bahco Insulated side cutting pliers have progressive edges, the cutting radius progresses along the edge in order to cut hard material like piano wire close to the joint and soft materials like copper and plastic insulated wire at the tip. Has a screw joint that provides excellent running and accurate alignment of the cutting edges. The distance from the joint to the centre of the cutting edges is reduced, giving greater leverage and increased cutting capacity. Have a black, anti-corrosion treated finish made from high performance alloy steel, and have plastic injected handles. Induction hardened cutting edges, and round shaped jaws give improved accessibility in confined spaces.